When the steel screen mesh is so rusted it is weak! What are the most important features for a security screen door? Many homeowners want a steel screen mesh to prevent someone from cutting through the screen and reaching inside to unlock the door. Their idea of a security screen door is that it should be secure enough to keep honest people out. For example, if they have pool in the back, they want to allow the fresh air to come in the front, but don't want someone to be able to just walk through the front door without their knowledge. 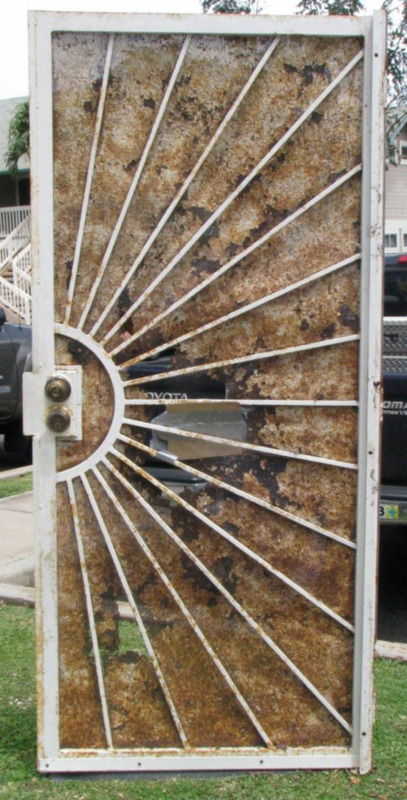 Once the rusted screen is cut through, the simple thumb lock on the inside of the door is easily flipped, and intruders are in the home. For most homeowners, what they really need is a strong rust proof screen door that has a double keyed lock on the inside. With a double keyed lock, like the PCA Tasman screen door lock, it is similar to having a deadbolt with a double key lock. Even if an intruder was able to get through the screen, they would not be able to unlock the door without the inside key. Is this something that your customers ask about and you wish you had a better solution for? Inquire about becoming a PCA Preferred Partner, or request a screen door display for your store. Are you a homeowner that wishes your local home store had security screen doors with these type of feature, plus style and durabilty? Tell us who your local home center is!